Officials in Devon are preparing to deal with possible snow and ice across the county after a severe weather warning from the Met Office. An arctic front is due to arrive in the county on Thursday afternoon, bringing strong winds and rain, as well as a significant drop in temperatures. Devon County Council said its control centre was monitoring the situation. 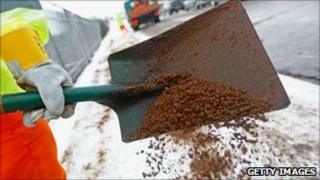 It added that teams had been continuing to do everything they could to keep the highway network as clear as possible. The arctic front conditions were due to linger into Friday, with widespread ice and 2in to 4in (5cm to 10cm) of snow possible, the Met Office said. Up to 8in (20cm) could fall on high ground, especially Exmoor, and along the north coast. The county council has been working this week to refill about 3,000 salt bins with 400 tonnes of salt across the county. At the start of the week, the council said it still had 18,000 tonnes of salt in stock, with another 5,000 tonnes on order.